There isn't a massive choice when it comes to dedicated sound cards these days. Sure, there are lots of cards for the would-be musician, but for the gamer or media enthusiast the choice essentially comes down to working out whether to buy a Creative card or stick with the motherboard's chip. Auzen hopes to change that, by licensing technology from Creative - namely the quite superb X-Fi chip. This is the first time that Creative has licensed any of its chips to a third party. What makes it an interesting choice, however, is that there are already a lot of Creative cards based on the silicon X-Fi heart. So how is Auzen's effort any different? Its previous PCI audio foray, the X-Meridian, flirted with being a flawed genius. It was a wonderful card for enjoying music or videos, thanks mainly to the fantastic build quality and engineering. Yet gaming performance was a significant let-down. Auzen appears to hope that switching to the X-Fi processor will give it the all-round sound card capability that you can reasonably demand for £120. 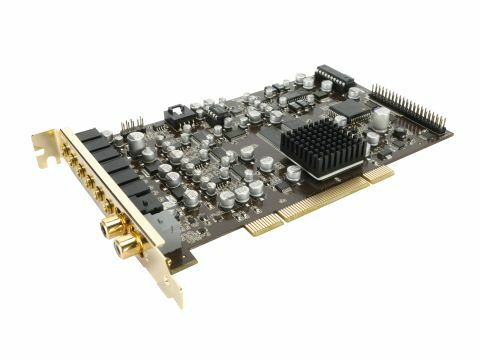 Unsurprisingly, the main competitors to the X-Fi Prelude are Creative X-Fi-based PCI boards. Or, to be more precise, X-Fi cards bearing the increasingly tiresome Fatal1ty branding. These are the standard version, the Champion Series and the Professional Series, with the Prelude priced closest to the Champion Series at the time of writing. All of these cards feature a front panel connector, which is an extra purchase for the Prelude (also known as the X-Tension Board). Because they're based on the same audio processor, there isn't a lot to differentiate between quality of sound - it's all excellent. However, the Prelude has the edge when it comes to build quality and engineering. The software suite is also intuitive, useful and doesn't smack of bloat. Add to this the optical connectors and the included optical cable, and the Prelude begins to sound like an extremely attractive proposition. There's even downloadable driver support for Dolby Digital Live, DTS Interactive and ALchemy for Vista-based gamers, although these are still beta versions. Overall, it's an impressive all-round package, despite the lack of a front panel.